This Fuel Filter Kit is designed to be used on Johnson® and Evinrude® V-8 Recreational Outboard Models. The fuel filter cartridge, P/N 174144, should be replaced as required or yearly. The kit includes 90° fittings to install the filter in a fuel system equipped with 9.5 mm (3/8") I.D. fuel hose or 9.5 mm (3/8") O.D. copper tubing. These are the minimum sizes for V-8 models and all fuel fittings must be a minimum of 7.1 mm (9/32") I.D. Mounting hardware and hose clamps should be obtained from your local marine dealer. 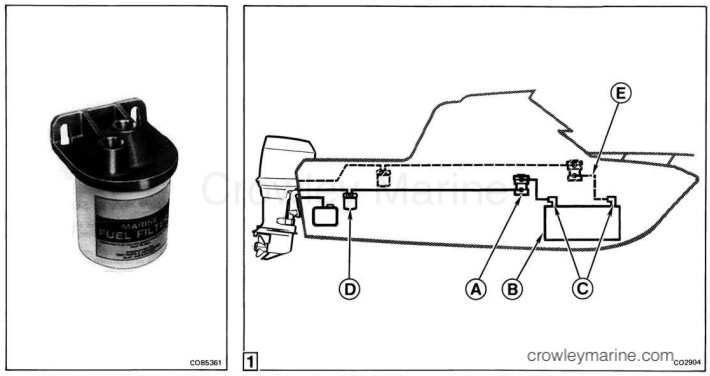 Determine a mounting location for the fuel filter assembly. The filter should be mounted between the electric primer pump and the engine in an area that is accessible for service. Select a mounting area with enough clearance for future fuel filter cartridge replacement. All fuel lines should be above the full fuel level of the fuel tank to eliminate the need for anti-siphon valve. When the filter, electric priming pump or any portion of the distribution line is mounted below the full fuel level of the fuel tank, an anti-siphon valve is required at the tank withdrawal fitting(s). Dual engines require separate pickup tubes with one filter and one primer pump in each line for each engine. Obtain two 3/8" diameter screws or lag bolts and hose clamp(s) for 3/8" hose. 1. Lubricate fuel filter cartridge gasket with clean oil and thread filter onto bottom center bracket stud. Tighten 3/4 to 1 turn after gasket makes contact with bracket base. 2. Fuel filter mounting bracket has two 3/8" mounting slots (F). Use the filter mounting bracket as a template and mark bracket mounting holes. 3. Drill lag bolt pilot holes or mounting bolt holes and secure fuel filter bracket with bolts (not provided). 4. Determine which fittings will be used and install fittings provided into filter head. Observe the arrow symbols on top of the filter bracket designating fuel flow. If flared fitting is used, insert it into the cavity designated "IN" by the arrow. If fitting threads are not teflon-coated, apply Pipe Sealant, P/N 910048, to threads. Position fittings to align with hose routing. 5. Connect fuel hose or copper tubing to filter fittings. 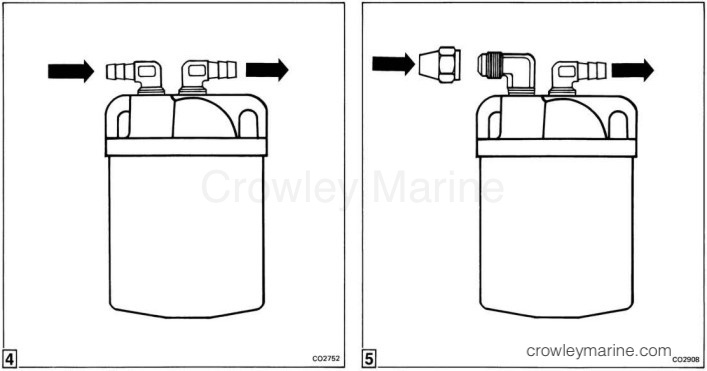 Install the hose or copper tubing from the primer pump to the fitting designated "IN" by the arrow. Install the hose to the engine onto the fitting designated "OUT" by the arrow. 6. Make sure all fittings used in the fuel system have a minimum of 7.1 mm 9/32") I.D. NOTE: Severe powerhead damage can result from an inadequate fuel supply as a result of a restriction in the fuel system. 7. When all fuel system connections have been completed, turn on electric primer pump and check all connections for fuel leaks.